1 Hotels.com Welcome Rewards night - effective 10% discount. Probably should have credited to Priority Club. 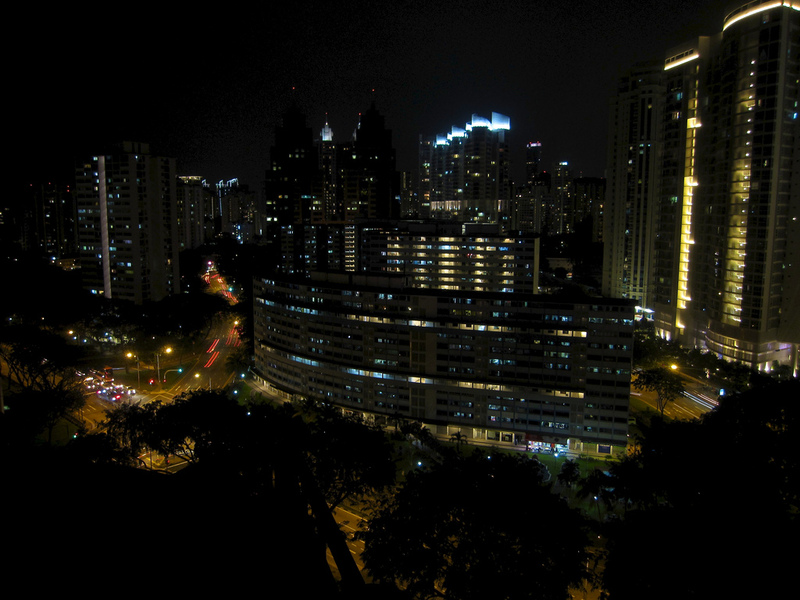 We needed an extra night in Singapore on top of my initial booking with the InterContinental, thanks to award availability changing on me during the booking process. By the time I got around to sorting the extra night, the IC was too expensive, and I reverted back to the Holiday Inn, which was booked via Hotels.com – earning one night in their Welcome Rewards program, in which which I’m slowly building up to a free night. After arriving at the Holiday Inn in our Jetquay Mercedes, we checked in quickly and headed up to our room on the 14th floor (I think). It’s kind of obvious why this hotel is named ‘Atrium’ – it’s the centre-piece of the place, a huge glittering cylinder that works it’s way up over 20 floors, with all rooms facing outward (it would seem) from the central atrium. You can see more in the following video, taken the next morning. 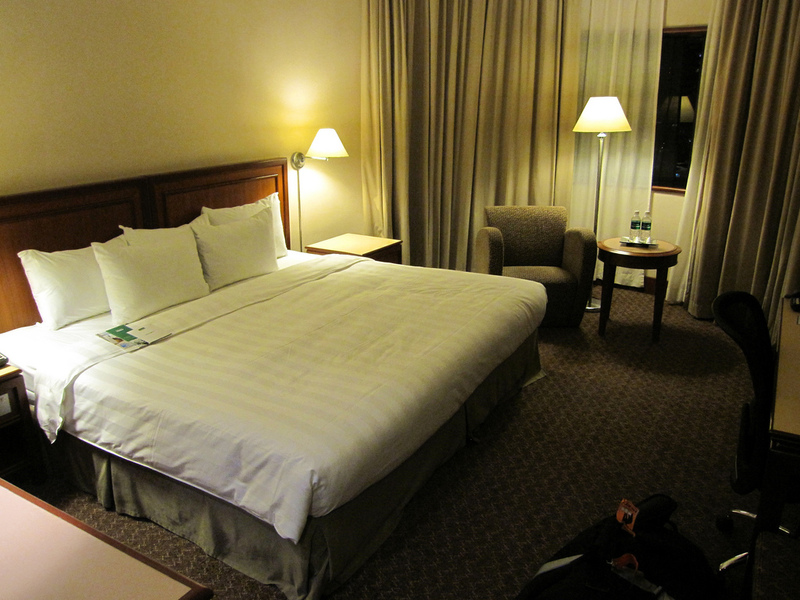 I was pretty happy with the room – roomy, massive bed, nice view, and good air-con! It was getting late, we were tired so we just crashed without eating much of anything. The next morning we headed down to breakfast on one of the lower floors. It was a pretty good spread, but the sun was heating up the area a lot by that point so we didn’t stick around too long. We had a few hours to kill before moving over to the InterContinental, so we met up with some friends who happened to live close by, then wandered back to the hotel to catch a cab over to the IC. 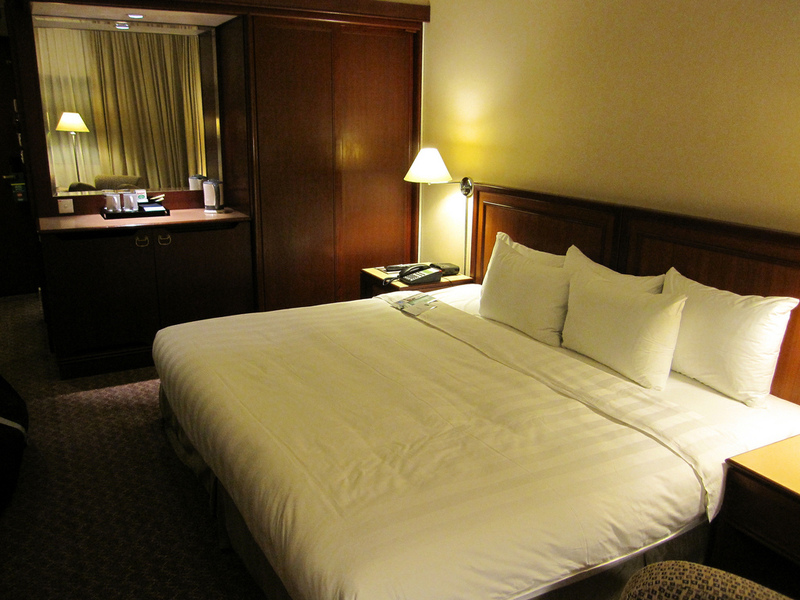 It was a nice one night stay. No issues with the hotel itself; the night was purchased at an acceptable rate and I was happy with the room and breakfast. The location, however, would be somewhat inconvenient for a longer stay as it’s in a mainly residential area and you’d need to take a taxi to head anywhere near to the city centre or Marina. But I knew that when booking.